What I am loving right now! It’s been a while, STYLEglossies! I took a week off from blogging for a super exciting reason; my husband and I bought our first house! As you can imagine, things are a little nuts right now. But not to worry, I will be back in full swing once my new office is set up. Be on the look out for photos of our new place along with lots of home decor and design posts! Today I have six key pieces that will never go out of style– all great additions to your fall closet! Enjoy! Laura Mercier Lip Glace in Bare Beige is my go to color for all seasons and reasons. It looks great by myself but can also be layered on top of your favorite lipstick. It is the perfect everyday gloss. Call me old-fashioned, but I still believe in notebooks. I write everything down (or else I would literally forget it ALL). This cute gold foil book is the perfect size to keep in your bag. You never know when inspiration might hit! I am seriously in LOVE with personalized jewelry. I already have an engraved disc necklace from S & D but I am itching to add this bar to my collection. I love the idea of adding your child’s name (or children’s initials), your wedding date or the coordinates of a special place. This is truly something that will NEVER become off trend. The quest for a perfect poncho resumes each and every fall. I am always on the look out for one that doesn’t add too much bulk, goes with everything and can be worn multiple ways. This super affordable option (UNDER $40!!) from BP fits the bill. I love that you can wear it open or belt it for a sleeker. There are two kinds of boots in this world. There are the cheapies that you snag on sale at places like Marshall’s and DSW. Those are the trendy, great buys you find when you are never looking for boots. And then there are THESE kind of boots. The kind that have the most AMAZING, buttery leather. The kind that make your heart literally skip a beat when you think about all the outfits you could wear with them. And then when you finally put your foot into a pair of said boots trumpets sing and you hand over your credit card, only to fall flat on the floor when the cashier tells you your total. Yep– these Vince Camuto beauties are NOT cheap, but they are also worth every penny. They are well made, comfy and timeless. Plus, they are just as soft and well made as other brands like Tory Burch (seriously, the leather is nearly the same), but cost half as much. So worth it!! You will wear them all season! I love a good canvas tote. They are easy to clean and will hold everything– and I mean everything! A great tote will hold your laptop when you are headed to Starbucks or it will make for an eco-friendly shopping bag when you are at the market. This one by Street Level happens to be stylish and functional- plus it comes in three color combos! The East Coast is about to experience some major rainfall in the next few days thanks to a tropical storm making his way up the Atlantic. Although this summer was particularly dry and we could certainly use some rain, I am not looking forward to the next seven day (yes– it is projected to rain for seven days here in New York). This kind of weather would make anyone want to curl up on the couch or under the covers and watch a mega marathon of chick flicks. Unfortunately most of us can’t spend our work week in PJs, but we can stay cozy and stylish even when the weather isn’t cooperating. I am a huge fan of leggings (aren’t we all?) paired with soft knits when I am looking for ultimate comfort. This poncho is awesome on so many levels, but the rich burgundy color and the price are what sold me on it. Add in these super stylish rain boots (finally, a welly that won’t make us walk like Frankenstein) and you’ll be ready to take on all the elements. I’m not so secretly obsessing over this M.Z. Wallace bag. I was introduced to it by my friend Jennie and ever since I have been dreaming of adding it to my closet. Quilted nylon bags are having a moment right now. I am seeing them everywhere! How do you dress for a rainy day? 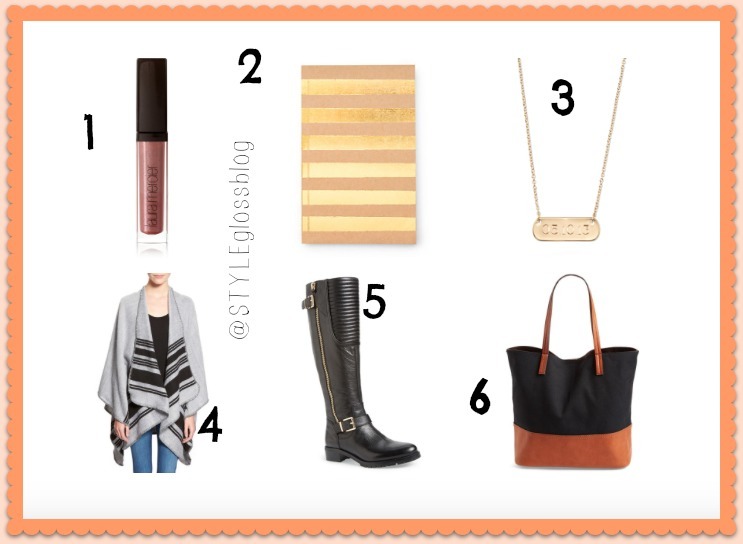 Tell me by hash tagging #STYLEglossblog!